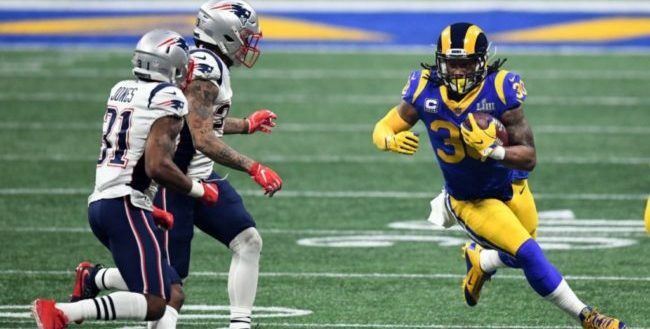 The Los Angeles Rams’ 2018 journey ended with a 13-3 loss to the New England Patriots in Super Bowl LIII on Sunday, February 3. New England shut down the Rams offense for four quarters, holding Los Angeles to 260 total yards. The Patriots entered the game with a clear, well-scouted gameplan. 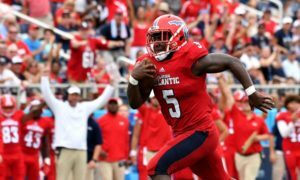 It would not surprise me if Patriots head coach Bill Belichick called his former defensive coordinator Matt Patricia for help plotting it out. Patricia’s Detroit Lions gave the Rams offense a lot of problems with their gameplan, despite being outmanned. Two months later, the Patriots used many of the same tactics that the Lions employed, and they worked. Belichick and defensive coordinator Brian Flores employed more zone coverage than man in an effort to take away the Rams’ deep threat. They kept the game in front of them and focused on forcing Rams’ quarterback Jared Goff to beat them. New England disguised their pass rush and focused on shutting down the Los Angeles running game. Unfortunately, the Patriots exposed a simple problem with the Rams offense: opponents have enough film now to figure out the Los Angeles offense. It’s up to head coach Sean McVay and his offensive staff to adjust their offensive schemes for next year if the Rams hope to make a return trip to the Super Bowl. I have few criticisms for McVay. He’s done an outstanding job leading the Rams, and I have no doubt that the team is in good hands for the future. However, McVay still struggles with abandoning the running game. The Rams struggled to run the football early in the game, and McVay gave up on it. What’s worse is that while the Rams gave up on establishing the run, they still kept running play-action. The Patriots were never going to bite on play-action if they didn’t respect the running game. McVay’s offense is built around the run. Teams won’t respect that strength if it’s abandoned. The Rams played right into Belichick’s hands by becoming one-dimensional when they didn’t have to be. Los Angeles was in the game for all four quarters. They had time to establish the run, but McVay just kept throwing. The Rams failed to impose their will on the Patriots defense through the running game, and they paid the price for it. The Rams took plenty of heat for giving up 154 rushing yards and 10 receptions for 141 yards to wide receiver Julian Edelman. However, they also made future Hall of Fame quarterback Tom Brady look mortal at times while also shutting down the deep game. The Rams clearly weren’t perfect, but their bend but don’t break defense pressured Brady and shut down the Patriots offense enough to win this game. Los Angeles forced five punts and stopped the run for three quarters. It was only after New England wore down the Rams’ starters that team gave up much of its chunk yardage. If someone had told me that the Rams would hold the Patriots to 13 points two weeks ago, I would have cracked a cold one and celebrated a Rams’ Super Bowl victory. This loss isn’t on the defense. In fact, Rams’ defense would have more than enough reason to blame the offense for what happened. Rams running back Todd Gurley entered Sunday’s matchup with the Patriots as one of the NFL’s most valuable and explosive players. 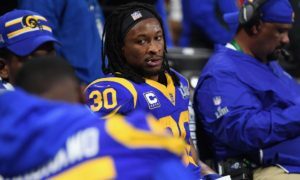 What we saw is one of the league’s best teams treat Gurley as if he had only a small role on this team. Gurley registered 10 carries for 35 yards as the Rams’ leading rusher. He also caught only one pass for -2 yards. It’s too late, but at this point I would like to know if the Rams truly gave up on the running game or if Gurley’s health caused McVay look elsewhere. If Gurley’s health is an issue, then there is a bigger picture. Did Gurley feel comfortable on his knee? I ask because his body language during the game suggests that something was wrong. He looked lost. Maybe I’m reading it wrong, but it’s clear something is going on. Gurley just signed a long-term extension last summer. 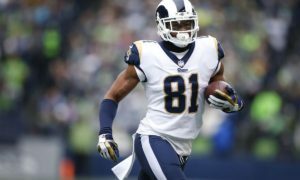 Now is it possible that the Rams have buyer’s remorse? Or is it really about ensuring Gurley spends the next six years in Los Angeles as one of the best in the game. It would be nice to have an answer. The loss hurts. Let’s be honest about that. Losing a second Super Bowl to the Patriots stings. However, the victory was clear. The Patriots came prepared and took away virtually all of the Rams’ offensive strengths. Given the Patriots’ gameplan, it’s fair to say that they were the better team. I stand by my belief that the Rams are more talented. However, talent can only take you so far. The Patriots have beaten many teams more talented than them. The best thing the Rams can do is get back in the film room and start breaking this all down. Los Angeles has the pieces in place to compete for Super Bowls. However, there is still much to learn. The Patriots won this time, but like I’ve said multiple times, the thing about McVay’s Rams is they always respond to losses by getting better. Nothing is guaranteed in life, but these Rams have a chance to come back better than ever. Buckle up your safety belts, because this journey isn’t over.